Standard means regulation on technical characteristics and management requirements used as standard for classifying and appraising products, goods, services, processes, the environment and other objects in socio-economic activities with a view to improving the quality and effectiveness of these objects. Standard will accord further with the market when it can resolve the concerns of consumers and consumers can engage in standards developing processes. Consumer preferences, social issues and trade agreements are directing the expansion of working programs related to standards to make the participation of consumers becoming more essential. 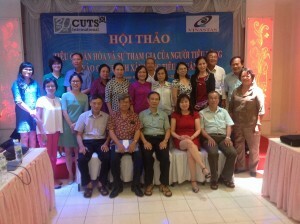 With the aim of raising awareness and building the capacity of consumer associations and organizations in Vietnam on standards and standardizations, so that they can participate more actively and effectively in the standardization processes, then they can use quality assured and friendly environmental goods and services, CUTS Hanoi Resource Center, in collaboration with Vietnam Standards and Consumers Association (VINASTAS), with the support of SESA programme “Trade promotion through standardization in the South and Southeast Asia regions”, funded by the Swedish International Development Cooperation Agency, Sida and under the management of the Swedish Standards Institute, SIS, organized two training workshops on “Standardization and the participation of consumers in developing standards processes” in Hai Phong City during 20th – 21st August, 2015, and Nha Trang City during 1st – 2nd October, 2015. 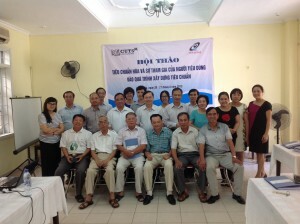 The training workshops were held successfully with the numerous participations of representatives of consumer associations in South and North Vietnam.